Kundalini is a word in Sanskrit that translated into English means coil. We are all born with Kundalini and in most of us our Kundalini remains dormant inside the perineum wound into 3 ½ circles, forming a coil. This is not something most people are aware of but those who seek to live on a more spiritual plane know of the Kundalini within us. Many people who study and practice yoga seek to develop their Kundalini because the belief is that harnessing the power of your Kundalini is needed for attaining a union with the divine (Yoga), the ultimate achievement of spirituality. In this article when yoga tradition is mentioned it refers to the various spiritual pathways that strive for Yoga, which is union with the divine, as its final goal. Traditional beliefs claim that after it’s been awakened, our Kundalini is capable of removing the blockages in our major chakras, cleanse, open and help our chakras grow until they’ve fully bloomed into full lotus forms. When our Kundalini completes this process on all our chakras the innermost core of our Kundalini will arrive at the chakra at the very top of our head, the crown chakra. When this is fully, cleansed, opened and developed we will attain our highest achievement of spirituality, that of Yoga. This is no easy task as it’s very difficult to awaken our Kundalini. There are those who have practiced yoga for decades and still have not awakened their Kundalini. Many believe that very few have actually been able to fully awaken their Kundalini. Those who were able to achieve this have then gone onto spend decades in the cleansing process. This can take many years to fully cleanse, open and fully develop a chakra. The process begins at the base chakra and moves upwards in order. 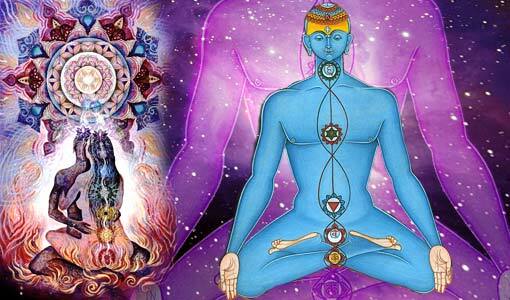 The Kundalini will spend years at each chakra working its way up to the 7th chakra, the crown chakra taking decades. Because the time for this is so long many people will pass away before reaching their final goal in the process. Just having your Kundalini reach the crown chakra doesn’t mean you’re finished, it’s only the start of the true journey of the Kundalini. There are many people fascinated in Kundalini energy because of its ability to transmit psychic powers. But this is not the purpose of the Kundalini, only a by-product of the awakening of the Kundalini. Those who practice Reiki do not recommend using psychic powers at all. Their belief is that this may cause you to become arrogant and egotistical and therefore remove you from the True Source of power. This would only interfere with your goal to become closer to the Truce Source and achieve Yoga, so it must be avoided. To continuously improve the process of cleansing. Once the Kundalini is awakened this process goes on 24 hours a day. The Kundalini provides the energy for the cleansing process and enhances the development of all your major chakras. Without this energy it is very difficult to cleanse the innermost areas of your chakras. Kundalini assists in the unification of the practitioner to the Oneness in order to return to the Divine Source as a complete whole. The energy provided by Kundalini provides the bridge between the practitioner and the Oneness. There are various exercises that people undergo in preparation for the awakening of their Kundalini. These involve physical posturing, precise breathing, meditation, and chanting. One must be adequately cleansed and purified to be fully prepared for its awakening. If you’re not really pure enough and begin working on the awakening, there will be serious problems including with your health once the Kundalini is awake. The Vase Breath technique, which in Sanskrit is called “Kumbhaka” and in Tibetan, “Rlung Bumpecan”. The three locks or the “Bandha Traya” technique. After many years of practicing one of these techniques some were very lucky and blessed to have been able to awaken their Kundalini. The energy released from an awakened Kundalini is so enormous that people still can experience various problems although they have prepared for this for many years. The truth is that this is not necessarily a pleasant experience. However in this time of the New Age or the Age of Aquarius there are easier ways one can achieve spiritual growth. Awakening the Kundalini is much easier now than in past years. With someone else’s help your Kundalini can be awakened instantaneously. The method used is called “Shaktipat” which means a transfer of energy in Sanskrit. This method utilizes someone else’s energy to assist you in awakening your Kundalini. The awakening or Arambha stage – This happens when the Kundalini’s shell is broken as well as the knot or blockage at the base chakra (Brahma knot). This knot is very near the center of the Kundalini. The absorption or Parichaya stage – This is the stage where different layers of the body are cleansed. The Final or Nishpatti stage – This stage occurs at the Ajna chakra (the third eye), the last big knot known as the “Rudra”. You are now only a step away from having your crown chakra opened. Once this happens you will achieve self-realization then cosmic realization and then achieve Yoga. The real process of Kundalini is somewhat different than what was described above, which was the traditional process. The four different stages above are just the beginning. When the Kundalini arrives at the crown chakra, attaining self-realization is not that easy. Once the Kundalini’s core arrives at your crown chakra, then the divine chakra which is above you will now begin to open. This enables the larger part of your True Self which lives within the divine chakra, to descend down to your heart chakra where a smaller part of your True Self is and has been once your True Self entered your physical body. A group of parapsychologists from UCLA School of Medicine proved beyond doubt in 2012 that Kundalini practice alters your physical body and your brain. Once the two different parts of your True Self are together in your heart your True Self becomes stronger. You will be taken through various steps to achieve soul consciousness and then True Self Consciousness. But even here there will still remain many levels you will need to achieve before you attain Yoga. The process whereby your Kundalini’s core reaches your crown chakra is only the beginning of the unification process. When you’ve attained Yoga this means that you, the micro, join with the oneness, the macro, returning your True Self to the Source. The Core – This is the Kundalini itself and the last part of the Kundalini that moves. This can only happen once the Sushumna has opened wide and is now clean. The Fire – This is the part that does the cleansing. This is the released uncoiled energy and it looks just like fire and in burning all negativities and blockages out of the body, it cleanses. The Energy – If your crown chakra is open energy will flow out of it. Reiki TUMMO™ teaches that energy flows out continuously at about 1.5 to 2 meters. This is quite a lot of energy flowing out and the cleansing process is going on 24 hour a day. The idea is that once Reiki TUMMO™ attunement helps awaken your Kundalini you will be continuously cleansed, even during sleep at night. This is all meant to open your heart more quickly. These days many people are discussing and practicing the Kundalini. But one must take care as not every energy movement along your Sushumna , or the feeling of heat in the lower parts of your body or the energy in and around your crown chakra is really Kundalini. There are other types of chi that can create energy along your Sushumna. This can be caused if you are channeling energy from Reiki symbols at your Sushumna. This can result in a longer lasting sensation because you’ve stimulated the chakra so of course there will be feelings of activity in that area. Any activity in one of your chakras in the lower parts of your body can cause heat or your Kundalini might be stimulated but that doesn’t mean it’s been awakened. As you measure the energy level on top of your head just remember your crown chakra is there so you will naturally feel the energy. The question everyone is asking is how can you be certain that the sensations you’re feeling is Kundalini energy? The answer is that if you already have awakened your Kundalini and your entire Sushumna is open you should have the ability to sense the energy from 1.5 to 2 meters above the top of your head. You can feel the spray of energy releasing out the top of your head. When you feel this and then, using your hand, make a slashing movement through the energy field you can feel the upward current. The best way to check your Kundalini is by tapping into your Inner Heart. This is where the real truth is known. By using the purity of your Inner Heart you will never go wrong on your path of spirituality. Tagged awakening mind, awakening spirit, Chakras and Kundalini, Kundalini awakening. Bookmark the permalink.